As if seeing all the animals wasn’t enough for one day, after lunch we left the crater and visited a Masai village. On the way, however, we were treated to this tree full of monkeys. At the village we were welcomed warmly and gathered to watch several traditional activities, such as this welcome dance in the video below the photos (click on the link to watch). Look closely at the men’s feet, as they wear sandals made from old tires! The men’s jumping contest was great fun to watch (video below photos; the two videos are in different formats, hence the link versus embedded video). The women dance in their own way by bouncing their collars, as you saw in the first video. They invited the women from our group to join them, so of course I did. We then learned about village life. The women build the huts from mud and cow dung. The men are herders. Tourism is a big business for them as well. 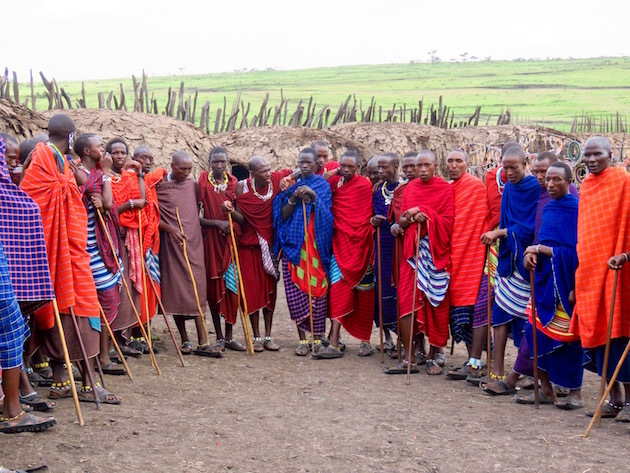 (Friends on our trip who had been to the Crater before said they visited the same village.) The women also make jewelry for us to buy (look behind the picture of me with the women to the display). Don and I were invited by one of the men to visit one of the huts. I had to use flash for two of the three inside photos, as it was very dark. Afterwards we were of course led to see the jewelry made by the woman who lived in that hut. I bought several bracelets made out of bone and not the colored bead pieces she had made–which didn’t make our Masai guide very happy. We were not aware of that expectation beforehand, however. This is what greeted us upon returning to the lodge at the end of a long day. What a great idea! I was ready to jump in–until I noticed that a lot of bugs decided to use my tub as a swimming pool! Tanzania Ngorongoro Crater Bath Time! We were also amused at this note about laundry (most safari lodges include laundry service). I’m pleased to report that I spotted no baboons decked out in my clothes, which were returned late that night. We still had one more surprise waiting for us. At dinner we were serenaded by the very spirited Washa Washa Choir singing native folk songs and leading us in a dance around the dining room. A great ending to a wonderful day—Mr. Fussy rated it 5 martinis, for sure! What a fascinating and colorful trip! Bugs in the tub? Baboons in the laundry yard? But serenading at dinner sounds like a nice way to end the day. Every day is packed with sights and delights! the travel days gave us time to regroup and prepare for the next adventure. Thanks, Linda and Linda, for coming along with us! OMG! WHAT AN AMAZING ADVENTURE!!!! So many phenomenal memories!